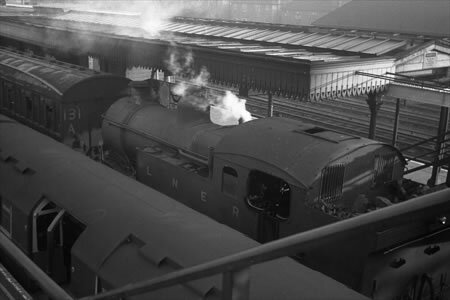 The Holden F5s operated regularly on the Epping and Ongar railway and were the locomotives used during the last days of steam operation in 1957. London Underground closed the branch in 1994 – with it resuming passenger services as a preserved railway in 2012. This is the motivation for the building of a replica F5. The Eastern Counties Railway reached Loughton in 1856. The new line diverged from the Stratford – Tottenham Hale route at Loughton North Junction and close to the site of what was to become Temple Mills yard. Stations were built at Leyton, Leytonstone, Snaresbrook, South Woodford, Woodford and Buckhurst Hill. At this time the land around the line was mostly undeveloped. The towns of Epping and Ongar were targets of further extension but construction had to wait until the ECR was absorbed into the GER. The line to Epping and Ongar was completed in 1865. The 11-mile single-track line opened on Monday 24th April 1865. The station at Loughton was re-located; the old site became sidings and was for many years used as a coal yard. 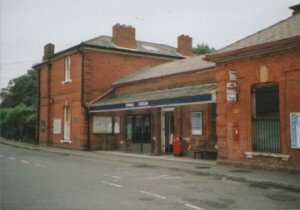 Stations were built at Chigwell Road (now Debden), Theydon, Epping, North Weald, Blake Hall and Ongar. Most services ran only as far as Loughton, however Ongar was soon enjoying up to 14 daily trains to London. The Loughton – Epping section was doubled in 1892. Coal, general goods and even milk made an important contribution to traffic. Ongar station was laid out as a through station – extensions beyond Ongar, to Dunmow or back to the GER mainline at Chelmsford were contemplated but never acted upon. By the 1930s overcrowding was becoming a major problem for the services into Liverpool Street. Various solutions were considered, however, the LNER lacked the financial resources for major investment. Local rail users proposed an extension of the Central line to Eastern Avenue (Ilford). The LNER proposed a straightforward overhead electrification of the line to Shenfield and the Fairlop loop. Investigation showed that both schemes would be loss making. A subsidy could not be agreed. A compromise was agreed with the Central line taking over the Fairlop loop and the line to Loughton. However the future of the Loughton to Ongar section was not considered at this stage. The compromise solution was included in the 1935 New Works Programme. Construction of the extension began in 1936. A new line in was to be built from Liverpool Street to Leyton via stations Bethnal Green, Mile End and Stratford. This was to mostly be in tunnel. At Stratford the line would rise briefly to the surface to allow cross platform interchange with local services. Another pair of short tunnels linked Stratford to the existing line just to the south of Leyton Station. A third section of tunnel would link Leytonstone with the Fairlop loop at Newbury Park. A new depot to service the increased number of trains was to open at Hainault. The work was scheduled for completion by the end of 1941. The work was of course delayed by the outbreak of World War II. Electric train services were extended gradually reaching Stratford in 1946, Leytonstone and Woodford during 1947, Hainault and Loughton in 1948 and Epping in 1949. Full-scale electrification to Ongar with through services to London was at one stage contemplated. However in the post-war era resources were not unlimited. In addition post-war planning had established the “greenbelt” to check the outward spread of London with future growth scheduled for the “new towns” further away from the capital. Suburban development around the eastern end of the Central Line would now be restricted. A C12 worked on the line for a short period in 1953. Woodford in 1948, Standard Stock and an F5. Nevertheless a new platform at North Weald and changes to the track layout at Ongar allowed a 20-minute service frequency to be implemented in 1949. Services were now operated by a small fleet of push-pull equipped F5s (No’s 67193,67200,67202,67203 and 67213). 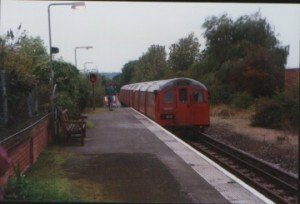 However it was to be another 9 years (18 November 1957 – Epping – Ongar) before the electric trains reached Ongar. Initially the Ongar-Epping services were operated by the two-car 1935 stock prototype unit. 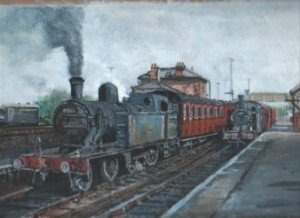 Some freight services to the many goods yards at stations along the line remained the responsibility of British Railways and were operated by J15 0-6-0 steam locomotives. Freight services were withdrawn from North Weald in 1964 and Blake Hall and Ongar in 1966. The 1970s were a difficult era for London Transport. Cost rose rapidly whilst usage was declining. The 1969 Transport Act had transferred control of London Transport to the GLC. However the lines north of Woodford were in Essex. Essex County Council was reluctant to provide additional subsidy. Passenger levels on the Ongar section were also very light. London Transport first considered closure in 1970. Essex County council agreed to provide a subsidy provided that costs were cut. The service frequency was halved. As a result the passing loop at North Weald was no longer required and was removed in 1978. 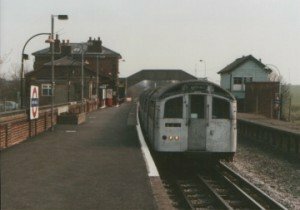 From 1976 a single train service was introduced and the loop at North Weald was no longer required. During the 1990s ORPS members renovated the signal box seen in the background. In the late 1970s it again seemed likely that the line would close and a preservation group was formed. Fares also increased dramatically following the “Fares Fair” confrontation between the GLC and central government. Increasing car ownership, the need to change trains and the journey times on trains designed for short journeys all discouraged traffic. However the line survived, restricted from 1981 to peak hour operation only. Blake Hall station used by literally a handful of passengers was closed in November 1981. The station building remains as a private residence though the platform was later demolished. A brief attempt was made to promote the service and an all day service was operated for a while. However, by the early 1990s usage had fallen to as low as 100 passengers per day. The service was making a loss of £184,000pa or around £7 per passenger journey. In addition it was reported that the line would need £4m of maintenance to remain in operation. London Underground applied for permission to close the line. This was granted and closure came on 30th September 1994. From 1990 Epping-Ongar services were operated by the Cravens units. This picture was taken during the last week before closure in September 1994. It can be seen that one of the station signs has already been removed! Before closure a group of enthusiasts had already been preparing to operate the line as a preserved railway, ORPS (Ongar Railway Preservation Society) had already formed and established good relations with London Underground. This had allowed restoration of the disused North Weald signal box to take place even before the line had closed. 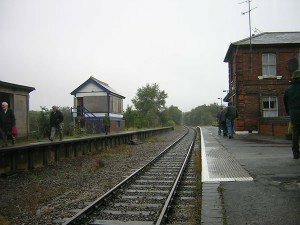 However in April 1996 the opportunity to operate the railway went to a commercial organisation, Pilot Developments, proposing to run both commuter services and a heritage attraction. Sale of the railway to Pilot Developments was completed in 1998. A varied collection of rolling stock was built up at Ongar, two four car units of 1962 Stock stood alongside 5ft gauge steam locomotives from Finland. A change in ownership occurred late in 2008. It was decided to cease running trains and to concentrate on improving the infrastructure both to enable locomotive hauled trains to once again run, and to secure the long term future of the branch. All these infrastructure improvements have been planned with a “Strategic Plan” in mind, and many are putting in place important parts to enable a future service to Epping. The trackwork through the whole station was renewed and realigned, both to the correct height for the platforms and to reinstate the original track layout with access into the yard, run-round and locomotive shed. The Cattle Dock and Milk Platforms still remain, as does the main station building and outbuildings which has been repainted in GER colours (1880-1930’s). Ongar is the only original operational GER station in GER colours! The previous Good Yards area (wasteland for many years) was purchased by David Wilson Homes who have built a small collection of houses. This does not affect the ability to run trains and the main station site remains in place. Inside the original 1865 station, the rooms have been reinstated to their original layouts, including removing newer partition walls, and opening up original doorways and fireplaces. The Parcels Office has become an educational and museum display and the rear waiting room a training and meeting room. The station has been completely rewired, and fitted with period style lights to replace the LT surface ducting and florescent fittings. A signalbox (formally from Spellbrook) has been brought to the railway, and installed at Ongar to safely control and signal the layout. This has been sited at the end of the main platform, and restored, complete with the original signal frame (donated by ORPS). A water tower will also be built to the original style, on or very close to its original foundations to provide water for the steam engines. In addition to the main platform, the milk dock is being restored into a bay platform (Platform 2) which will be ideal for diesel multiple units, and just to the north of the old cattle dock will become Platform 1. There may also be space for improved refreshment and shop facilities to be built in future years when funds allow. North Weald is being repainted in LNER / BR (E) (1940s-1960s) colours. The track for nearly 600m has been renewed, with the track height being corrected for UK standard stock, and provision of points and track re-laid through the original Platform 1 (Up loop), and as well as into the bay platform. In time this 2-coach bay platform will be restored for passenger use, to enable 3 operational platforms to be used at North Weald. Thanks to the signalling connected to the original 1888 signalbox, both Platform 1 and 2 are fitted for bi-directional working (trains can arrive / depart from either platform in either direction), and we have retained the King Lever so the signalbox can easily switch out when it is not required. The signalling and revised track layouts also enable access to improved siding facilities and enable safer and more efficient shunting. Inside the station, the rooms have been comprehensively restored, a 1980s ticket machine room removed to open up the waiting room to its original layout, and extensive restoration in the Ladies Waiting Room and Ticket Office. The station has been completely rewired, and fitted with period style lights to replace the LT surface ducting and florescent fittings. Disabled access ramps have been installed to both Platforms 1 and 2. The original concrete footbridge at North Weald had become unsafe, and is in the process of being replaced by a GER latticework example, which was saved from further down the Central Line near Woodford. This was kindly donated by ORPS, and new access steps from both platforms need to be fabricated, which will occur after opening when funds allow. ALL of the essential infrastructure improvements (both track, signalling and rolling stock) will widen the variety and frequency of heritage services, and are all key parts towards their central goal – to once again run trains to Epping; both as we preserve our transport heritage and to enable them to run services for the wider benefit of the local community, restoring this important link in our transport network.